Shereen wanted to honour her Iranian heritage on her wedding day, so she and hubby Steven planned a gorgeous bank canvas celebration that paid tribute to both their Scottish and Iranian identities. Their wedding took place on a beautiful day at The Barn at Harburn and was captured beautifully by MacLaurin Weddings. Steven and I met eight years ago on a night out. We were both acting as the ‘wingmen’ for our friends, and neither of us tried to give that much of a good first impression because we were so focused on setting up our pals. We quickly realised however that we were so similar in nature, and we were laughing so much together from the moment we met. 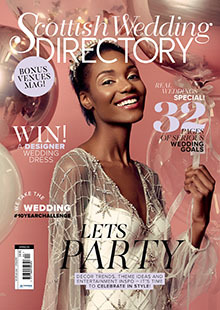 I did so much research into finding the perfect dress, namely looking through SWD! I got all my dress ideas from there and found all the best bridal shops to go to. My dress was designed by Pronovias and I bought it from Kavelle Couture in Edinburgh. It was crepe and tulle, well fitted and had a draped train. The front was completely plain and white, just what I wanted. The fitted look really complimented my figure and made me feel like a bride. My favourite part however was the back of the dress – it was a deep open back with gemstones draping over my shoulders and back. It added a touch of glamour to the dress and gave the dress something really special. It sparkled in the sunshine and gave me the statement look I wanted. We had a humanist ceremony because we wanted to be able to have lots of unique and individual aspects incorporated into it. We started with a traditional ceremony of standing at the front with our celebrant introducing the ceremony, followed by a lighting of two candles which represented each of us. Our vows were very different in that we sat in front of a traditional Iranian ceremony table called the ‘Sofreh Aghd’. This table has a symbolic meaning and all of the items on the table have their own representation of what a marriage should be. We incorporated the ‘Khaleh Ghand’, which was the process of sugar cones being rubbed over our heads by my sister, one of my cousins, Elnaz and Steven’s aunt, Annette. The meaning of this is to shower our life with sweetness. We also included ‘Asal’ or honey, which was the tradition of dipping our pinky finger into the honey and feeding it to one another, a symbol of feeding sweetness to each other. Our décor was quite simple as we let the venue and flowers speak for themselves, however I did buy a few items from John Lewis to spruce things up, including candles, balloons and some Ginger Ray products. My friend Debbie has her own event company ‘Without a Hitch Planning’. She was so kind as to provide us with mason jars, candles, large MR & MRS light up letters, photo booth backdrop and props, as well as so many other little touches. The speeches were all memorable for their own reasons. Steven’s was beautiful and heartfelt, particularly when speaking about his late Mum, Christine. Sadly she is no longer with us but she was certainly there in spirit and Steven made sure of it. We chose 12th May as our wedding date as that was her birthday and Steven really paid a loving tribute to her during his speech. The father-of-the-bride (Hossein) speech was memorable for being so sincere and endearing. He had to pull out his glasses to read his notes as he became very nervous, and he either had everyone in a fit of laughter or in floods of tears. We did have one more unique tradition after the wedding breakfast which was the Persian Knife Dance ‘Raqs Chagoo’. This involves a few female family members taking your cake knife and dancing with it until they were satisfied that we deserved to cut our cake. The tradition is to give each dancer money to entice them into handing over the knife. The reception atmosphere was like nothing I have experienced before. It wasn’t your typical wedding where people are forced onto the dance floor, it was really like being at a gig for your favourite band. The dance floor started of with just the Iranians enjoying some Persian/Arabic music, and slowly everyone else started to join in and we got going with British music that everyone knew the lyrics to. Around halfway through the night the dance floor was absolutely packed and you could barely move. I was even on the stage playing the tambourine at one point! As most people will say, not much changes when you marry after being together for a long time. However, we both just have this nice sense of security and belonging now and of course, getting to wear a beautiful ring every day!